What is this a close-up of? Another batch of tea time! Can’t have a tea pot without the tea cup y’know. The swirly tea pot and cup looked like this one (above), before I pulled a toothpick through the icing. The inspiration for these tea party cookies came from here . This one has the rainbow chicken pox. 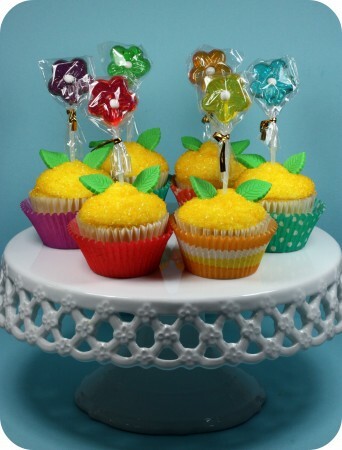 Instead of using a regular lollipop though, how perfect are these Twinkle Pop suckers ?! Here they are all bagged and ready to go. (Tea pot on one side, tea cup on the other). To make the cupcakes, I used my tried and true vanilla cupcake and buttercream recipes from Ms. Porschen’s book, Pretty Party Cakes . 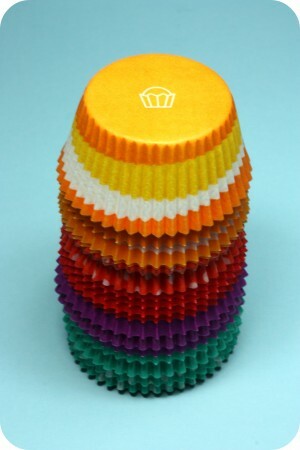 Cupcake liners usually get kind of greasy and the details are difficult to see once they’re baked, so I decided to make them in plain white liners and then set them in these colorful ones . Next time I’ll make sure I bake them in the right size though! lol. The rainbow liners are medium, and I baked mine in large. 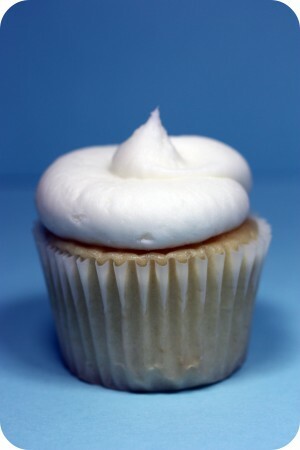 To pipe the icing I used a large round piping tip in my much-loved large pastry bag and rolled the cupcake in a bowl of yellow sanding sugar . 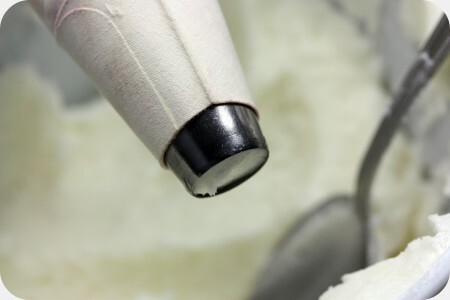 *** You’ll also need some cornstarch to dust your surface with, so that the fondant doesn’t stick. I just had to have one! (Ahem… or two…). For the cookies, I used the same icing and cookie recipes as I used in my sparkly tea party cookies post, which you can see here. 2. 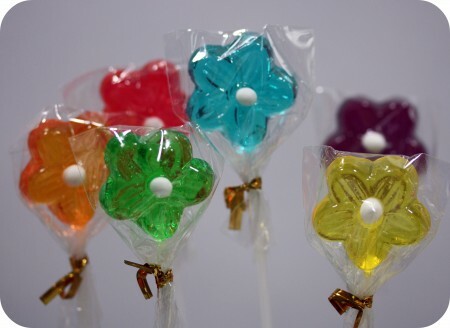 Disposable piping bags – You can also buy the non-disposable kind or make your own with parchment paper. Now, I’m off to clean the house, as it’s kinda getting well… neglected lately. Somehow it’s just not as fun as cookie and cupcake making. Enjoy making these easy cupcakes and cookies if you’d like to try! Those are BEAUTIFUL!!! I just tried making some yesterday, and they turned out terrible. Not sure if I should try again. It takes a lot of work and effort. Hi Marian, I just had to say that both items were a smash!!! Usually decorative cookies look good but leave something to be desired as far as taste goes, but yours were FANTASTIC!! The cookies were so buttery, they melted in my mouth!! 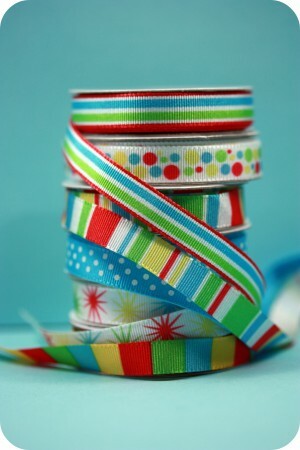 Everyone commented on the presentation (ribbons etc.) as much as they did on the product. Hey, I had to clean my house too after a bunch of 2-5 year olds got their hands on your cupcakes!! I think you might have a yearly gig… Thanks so much for your attention to detail and your creativity. It really helped set the tone for my daughter’s 5th birthday. Corynn, I just wanted to thank you for your sweet comments on my blog, and wanted to say ‘Don’t give up!” I was sooo frustrated when I first started decorating cookies myself, but with time I learned some techniques and tricks that really help! I’ll be doing and in-depth tutorial (I will — promise!!) to help out new decorators, and there’s lots of info. already on the net about it, but if you have any specific questions about what was not working for you, email me and I’ll try my best to help you! Rachel, thank you so much for your compliments! It’s always good news to hear that the treats were eaten and that adults and kids were happy with them! Asa, I know they’re not the most beautiful cookies out there but I thank you for your comment! Your cupcakes, I have to say, are stunning pieces of art… Each creation never fails to make me think WOW!! These are so beautiful! I absolutely love them! 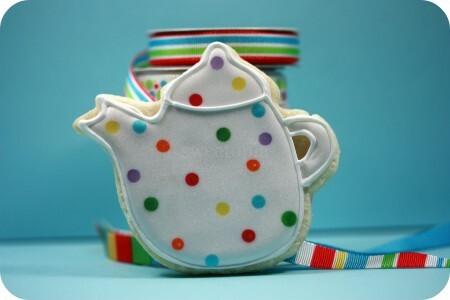 These are so cute…..I haven’t used my teapot cutter nor the tea cup cutter very much because I was at a loss as to how to decorate them…….you have truly inspired me with these….thank you so much! Hey ! As always gorgeous and very fun to read, helpful to! Very beautiful cookies! 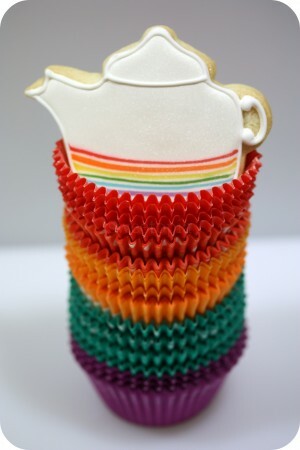 I love that stripey effect on your teapot and teacup! LOVE these cupcakes. Beautiful job Marian. I love your cupcakes and teapot cookies. wow :love: you’r sharing all your knowledge…. 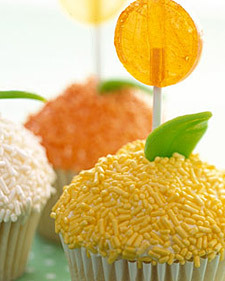 Amazing effort and you make it seems so effortless – you deserve many, many cupcakes for the work! 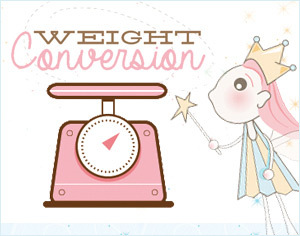 Marian…I love your blog! So so creative! Not only is everything pretty, it looks delicious too! I am IN LOVE with these cookies! They are gorgeous!!!!! This is my first visit to your blog and I am addicted! Thank you so much for your lovely comment! I will definitely keep your blog in my list 🙂 I have quite a growing list. The color is just amazing. These turned out adorable and flawless as usual! Such an inspiration and a great idea for a birthday party. I’m so proud of you. The commentary I’ve read from your fans out there should more than convince you of what your friends have been saying all along….you have become the Michelleangela of cookies and cupcakes. Folks, this woman agonizes over the slightest details with a smile on her face! Your appreciation encourages her creativity and growth as an artist. One question….when are we going to spend a cookie decorating day together this summer now that you’re free of the the teenage monsters? I just LOVE your polka dot cookies, and am planning to make them for a baby shower I’m hosting. I’m going to decorate cookie bibs with them. Naturally, I’ll do a lot of practicing first! Could you be VERY SPECIFIC as to how to get the polka dots on the royal icing base? At what point do you pipe them in the icing? How wet does the”base” have to be?? No problemo… Check out the butterfly cookie tutorial (under tutorial section) for the consistency of the icing – that’s important. Also important is that both icings are about the same consistency. 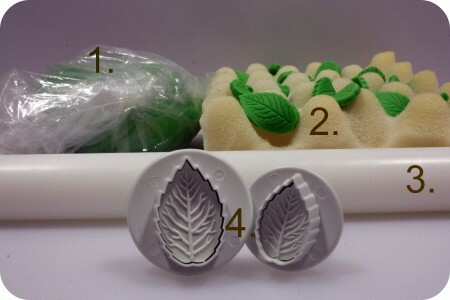 As far as how the dots are made, just place your piping tip right above where you want it placed and gently press your piping bag so just a weeeee bit comes out. Quickly lift the piping bag away. Gently give your cookie a little shake as it sits on the table to help the two icings ‘meld’. 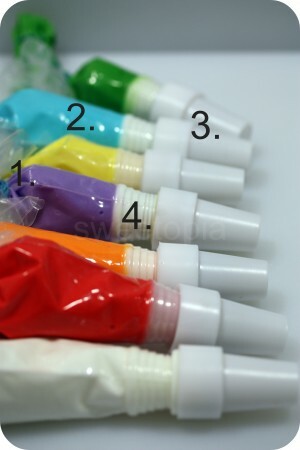 Have all your colors ready as it’s a quick process. HI MARIAN, I’M MRS. BAKER AND I’M DOING A RAINBOW TEA AND MY COLOR IS BLUE. 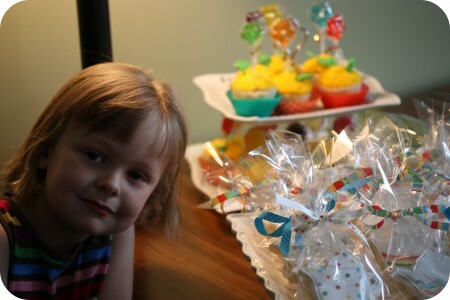 I LOVE THE IDEAS THAT YOU GAVE ME ABOUT THE LOLLIPS AND THE COOKIES AND CUPCAKES. IF YOU HAVE ANYMORE IDEAS FOR ME LET ME KNOW. 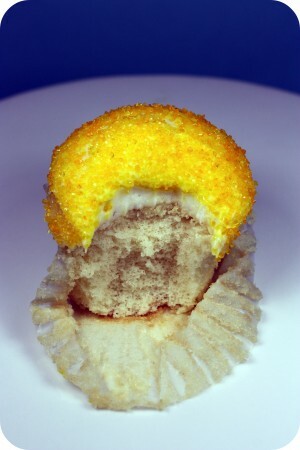 I love the idea of baking the cuppies and then setting them into another liner! I always hated how the cute designs are invisible once its baked. Fabulous idea!! Also, where did you find such fabulous liners? What a wonderful site. Thank you so much!!. 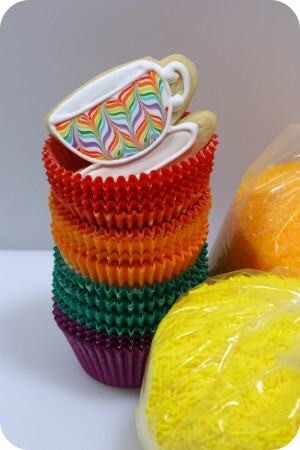 I have just featured your cookies on my blog as an inspiration for a rainbow birthday party. Beautiful! 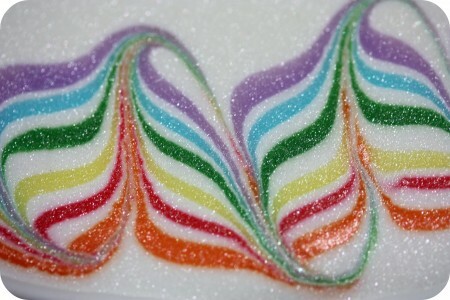 I love the rainbow-swirl effect-Thank you for showing us!! 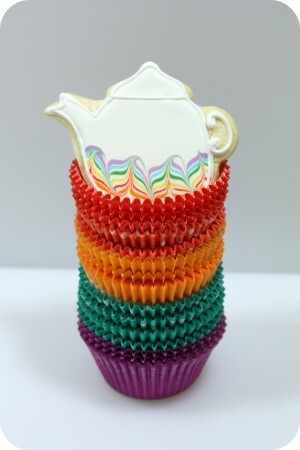 The cupcakes look delish…and the teapots, well they are just beautiful!!! I am so amazed at what you create!! Do you take any cookie orders? 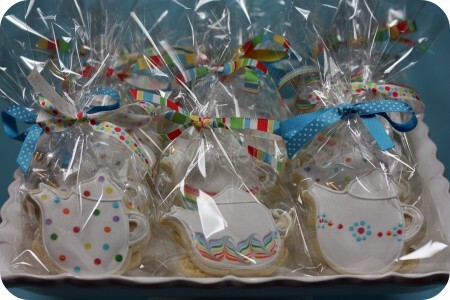 i would love to order some of the teapot and tea cup cookies for my daughter’s birthday party. Not sure if you do that or not? You are an amazing artist and baker, I’m in awe. Well, hi there, another Marian!